Wear to impress? 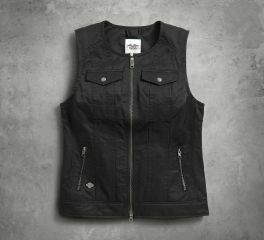 Women's H-D® casual vests made with quality and style. Perfect for your outdoor activities, let your casual vests do the talking. 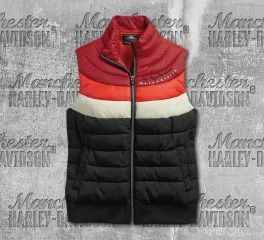 Harley-Davidson® Women's Striped Puffer Vest is made from 100% polyester, 100% nylon stripes, and polyester lining. It features Snap hand-warmer pockets with fleece lining. One interior stash pocket. Rib-knit waist. Full front zipper and embroidered and metallic embroidered graphics. 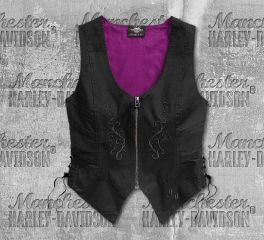 Harley-Davidson® Women's Hearts and Serpents Vest is made from 90% polyester 10% spandex sueded. It features a contrasting lining with custom print, wire in collar and lapels for shaping, embroidered graphics, and printed appliqué graphics. It has also zippered hand-warmer pockets, snap tab and full front zipper. The versatile Embroidered Zip-Front Vest offers a great fit thanks to the comfortable stretch twill. This women's casual vest is a great holiday outfit-maker with detailed needlework and velvet side lacing. Materials: 98% cotton, 2% spandex twill. Polyester/cotton poplin lining. Design Details: Contrasting lining. Grommets and velvet lacing on sides. Inspired by the timeless bomber jacket, but styled as a versatile vest. The Winged Logo Flight Vest features a contrasting, filled lining for a pop of color and lightweight warmth. The slightly cropped length keeps this women's casual vest looking fashionable over tees and sweaters. Materials: 58% viscose, 42% rayon. Contrasting nylon twill lining. Design Details: Polyester fill adds warmth. Rib-knit wool collar and waist. Pockets: Snap hand-warmer pockets. Zipper chest pocket with tire gauge slots. Graphics: Single color embroidered graphics with full-color overprint. Embroidered patches. Go bold or don't go at all. 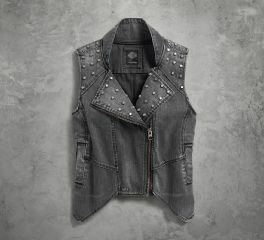 The Studded Denim Biker Vest lets you express yourself with acid washed black denim and silver studs. The industrial-look zipper is off center and the unique hemline adds interest. It's edgy and chic combined. Let the Essential Club Vest tell your story. 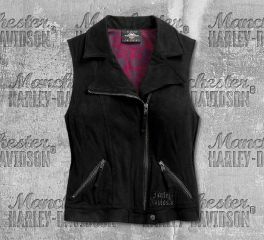 From pins to patches, this women's casual vest is a must for your next rally. The design and stitching is purposely minimal to keep all the focus on your unique collection of memorabilia.